Leander Paes, fresh from winning the U.S. Open, looks fresh as if he's just out from the shower. 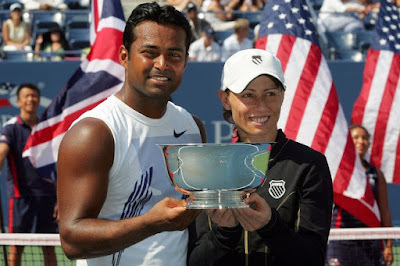 Cara Black of Zimbabwe and Leander Paes of India won their first U.S. Open mixed doubles title by beating Liezel Huber of the United States and Jamie Murray of Britain 7-6 (6), 6-4 in the final yesterday. Paes has won four Grand Slam mixed doubles titles, and Black has won three— but this was the first for each at Flushing Meadows and the first for them as a team. They were seeded fifth at the U.S. Open. Huber and Murray were unseeded. How is technology helping our tennis stars? Who else at the US Open? tips to improve your tennis game quickly! Sharapova analyzes Jankovic's game. Wait, WHAT? HCFoo's Tennis Blog. Copyright 2008-2017. All Rights Reserved. Powered by Blogger.